Beauty can be described as something that pleases the aesthetic senses, especially sight. We have all heard the saying ‘Beauty is in the eye of the beholder’. However, do we really know who the beholder is? It is clear that everyone is beautiful in their own special way. People of all different sizes, shapes, and colors are trying so incredibly hard to express themselves, and accept themselves, in this harsh time of society telling them what beauty is and isn’t. 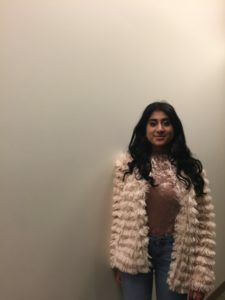 Sara Hussain, a sophomore here at Housatonic, is using her talent of modeling to make a statement and inspire people to feel comfortable in their own skin. Hussain has been modeling for three years now, since she was 16 years old. She isn’t involved with any agencies, she only works freelance with other freelance photographers and artists. One can tell by her explosive personality that she has been loving every minute of it. Many local photographers have used her for their projects, because they find her unique look so inspiring. You can tell just by the way she dresses and holds herself in public settings, just how special she really is, but what has modeling done for her and her self-esteem? “Throughout my youth I’ve been bullied by my peers for being ugly, and I’m sure that many people have faced the same thing. I began to believe these ideals that were predisposed on to me. I constantly would question why my skin is the color it is, why my hair’s not long enough, why I am not tall, skinny or beautiful the way the popular girls were? Through modeling, I’ve grown to accept the pieces of me that make me different from others, I appreciate my thick eyebrows, and complexion because it was what makes me, me,” Hussain said. Because so many young men and women are struggling daily with their appearance and self-esteem, it is so amazing to have people like Sara truly exceed boundaries and be a role model for those who don’t really conform to what society’s view of “beauty” is. College students around the world are struggling already with the stress of school and working, causing their self-esteem to plummet as well. Housatonic is filled with artists of all genres and arts. They inspire me and other students alike every single day. Sara Hussain, an avid lover of music and fashion, is using her art and extreme talent to encourage people to say “hell no” to society’s ridiculous beauty standards. Sara wants her peers and all people struggling with their self-image to know that they are beautiful, loved, and valued. She wants people to know that in order to find true happiness, one must be happy and content with the skin they are in. “Some advice I’d give to the beautiful ladies that are struggling with self image is that no one can change your mind but yourself. The fact that you have working organs is enough but these standards of unrealistic beauty placed upon you will never be fulfilled unless you are happy with the person you are. Finding inner beauty is the most important part of finding beauty within yourself,” Hussain said. You can follow Sara Hussain’s modeling page on Instagram at @HussainModeling to see her breathtaking photographs.